Maggie Hollifield, accidental child shooting: Parents who let their kids have guns must take responsibility for what they do with them. 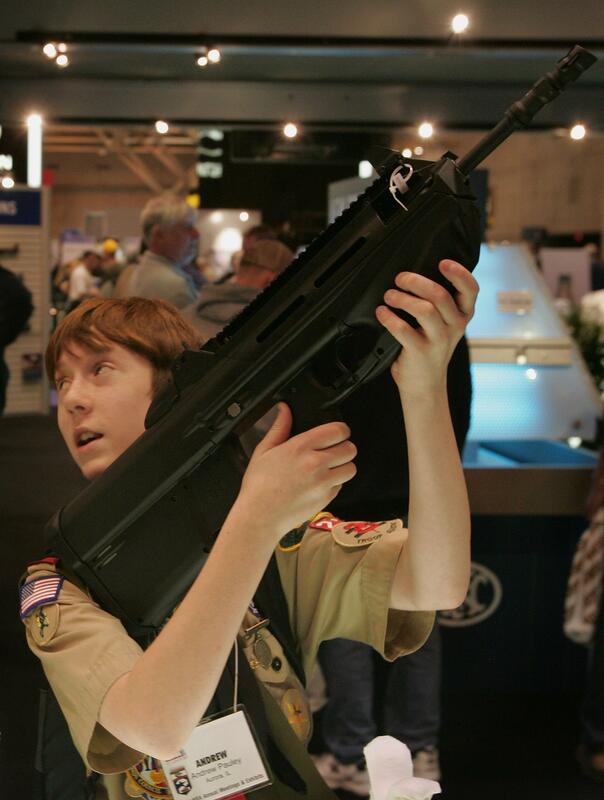 In this file photo, a Boy Scout looks over a FN rifle during the 136th NRA Annual Meetings and Exhibits in 2007, in St. Louis. Given my frequent harping on this subject, it will not surprise you to learn that I disagree with this conclusion. I don’t doubt that the brother was conscientious about gun safety. According to the report, he had even “corrected the father on handling the weapon on occasion.” But what that tells me is that the boy may have cared more about gun safety than his father did. And that’s the problem. In Virginia you can’t drive until you’re 16, plus three months. You can’t drink until you’re 21. But for some reason you can own a basic shotgun at any age. That blows my mind. Anyone who has ever had or been a child knows that no matter how well-intentioned or cautious they may be, children are impulsive and scatterbrained. And so are some adults, sure, but the difference is that adults are supposed to know better. Kids aren’t. Kids are irresponsible because their brains and bodies haven’t fully developed yet. They lack the judgment, experience, and perspective that comes with age. According to the Hollifield report, the boy’s father “stated that he trusted his son with the firearm and that his son was knowledgeable about maintenance and care of the firearm.” But no matter how responsible and knowledgeable your kids might seem, they’re still kids. They’re going to make mistakes and forget things because that’s what kids do. If you’re going to let your kid have a gun, then you can’t assume that they won’t do anything stupid with it. You have to assume that they will do something stupid with it, and you have to do everything in your power to make sure they don’t. That means caring more about gun safety than your kid does, not less. Some readers have emailed me questioning why I’m fixating on accidental child shooting deaths, given how relatively rare they are. And they’re right. The absolute number of children who are killed in accidental shootings is low. But these incidents could almost all have been prevented if the parents or guardians in these cases had been more attentive. The primary purpose of a gun is to shoot small holes in things, and if a boy shoots a small hole in his sister because he forgot there was a shell in his shotgun’s chamber, it is the fault of the parents. They were the ones who allowed him not only to have the gun, but to attempt to fix it, alone and unsupervised, in the freaking living room. An adult who gives a kid a gun needs to bear responsibility for what the kid does with it. Prosecuting the parents of the children in these incidents sends a clear message that society expects those parents to take care of their guns, and their children.